REUTERS/Gary CameronSnow, ice, and freezing equipment and workers slow down airport operations. Residents of the U.S. Northeast are still reeling from last year’s savage winter. But they could be about to get reintroduced to the joys of cold, ice, and snow as a winter weather system takes shape and looks poised to make trouble with Thanksgiving travel. Commercial planes are no strangers to extreme cold. Above 37,000 feet, the air is far colder than it is on the ground. Low temperatures on their own don’t stop air travel. So why does cold strike fear in the hearts of airport managers and travellers? Because it creates conditions that slow down airport operations. Significantly. Lift, it goes without saying, is what enables aeroplanes to take off and fly. 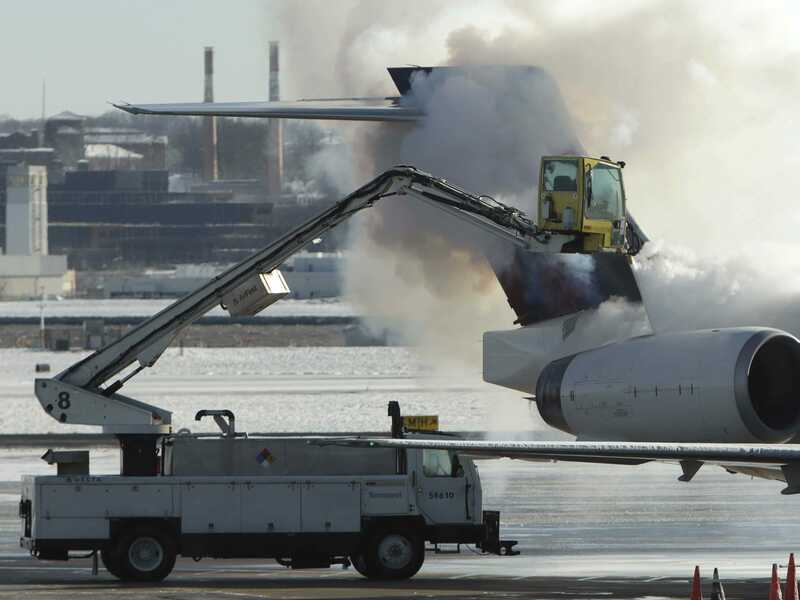 The problem is that while planes can be de-iced (usually by spraying them with a mix of water and glycol alcohol), getting ice off a runway when the temperatures are low and there’s no sunshine is much harder. “There’s hardly anything you can do,” Jack Gartner, who worked in operations at New York airports for over 30 years, told Business Insider. Especially since you don’t want to risk damaging the pavement on the runway. Potholes and other imperfections in the pavement make takeoff and landing less safe. The equipment used to pump jet fuel can freeze, so refueling planes gets tricky. That has slowed airline operations in the past. Simply put, cold weather makes it harder, though not impossible, to do everything necessary to get a plane in the air or on the ground safely, and to make sure everyone involved remains safe as well. Usually, that means flights are delayed. And when things get really bad, it means cancellations. So be prepared heading into what could be a tricky long weekend of holiday travel in the Northeast.